Earning itself the title of the ‘Highest High Tea in the world’, and quite a title too! 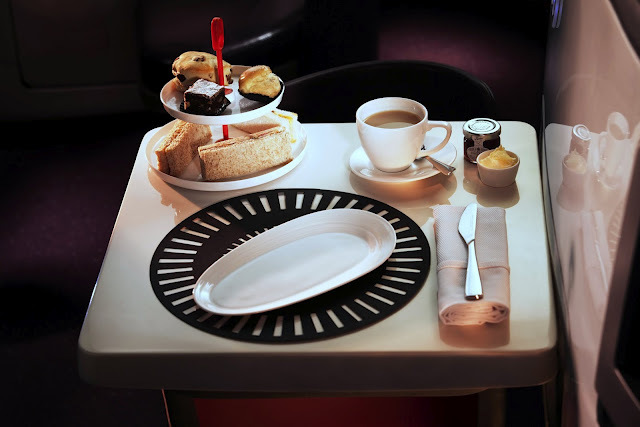 the new afternoon tea service is just one of the glamorous touches recently introduced into Virgin Atlantics new Upper Class meal service, unfortunately I wont be going anywhere upper class soon but the idea of having High tea at 35,000 ft sounds like a great way to spend a flight . Belinda Gurd, regional PR manager for Virgin Atlantic, commented that the High Tea service will add a unique element to the Upper Class service. “The new Upper Class meal service which includes our brand new beautiful Coup champagne glasses, bespoke designer cutlery, new menu and of course the iconic afternoon tea trolley, aims to bring the romance and glamour back to flying. “This new service is a perfect excuse for our passengers to experience something totally different at 35,000 feet!” said Gurd. The Virgin Atlantic High Tea is presented on a two-tiered stand and consists of scones with jam and cream, mini cupcakes and finger sandwiches in keeping with the tradition, to complete the service passengers are given a tea pot and cafetiere plus a selection of fine herbal and fruit teas. To ensure the high tea service meets the standards of high tea aficionados, Virgin Atlantic has enlisted Michelle Milton, founder of the High Tea Society, to provide her thoughts on the latest addition to the Upper Class menu. “Virgin Atlantic’s Upper Class service captures the essence of traditional High Tea but in a uniquely Virgin way. The time-honored scones with jam and cream and finger sandwiches are just as one would expect, however the unusual setting provides a modern twist on high tea.